A quick 45- minute drive from the Nice airport will land you in a place where the rich and famous go to escape it all. 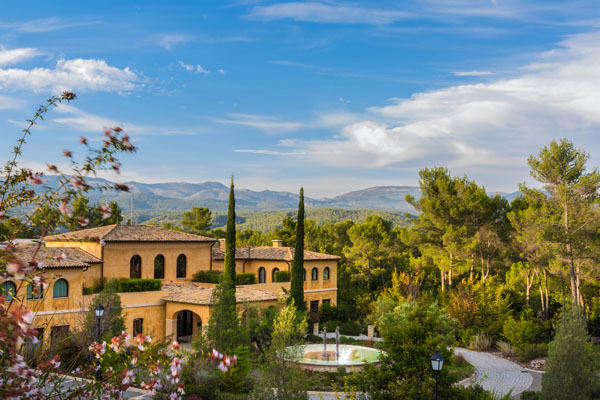 The Terre Blanche Hotel Spa and Golf Resort, tucked into the Cote d’Azur countryside is a magical spot surrounded by lush green forests, fields of lavender and quaint villages. Opened in 2004, Terre Blanche was at one time a private estate owned by Sean Connery. Today, it consists of 115 suites and villas set in landscaped grounds with modern sculptures from the private collection of the hotel’s current owner, Dietmar Hopp. The property has two internationally renowned golf courses; Le Chateau and Le Riou as well as the only training center of its kind in Europe, where the very best teaching methods are used. Thanks to state-of-the-art, environmentally friendly facilities, Terre Blanche has GEO® (Golf Environment Organization) accreditation and, in 2017, was voted the Best Golf Resort in Continental Europe by the well-respected Golf World UK magazine. The two courses consist of valleys, lakes, ravines, waterfalls, and forests. Golf architect Dave Thomas preserved the existing contours and natural features of this magnificent site. His signature bunkers with their indented edges are a feature of both courses. Beyond the golf and the beauty of the hotel’s location is its spa. With 35,000 square feet over two floors, the hotel’s spa is designed to emulate a traditional Provençal “Bastide.” The hotel has just launched a new spa partnership with the iconic and internationally renowned spa brand, Valmont, where 7 new Valmont treatments, including the signature ‘Facial Treatment Terre Blanche’ by Valmont are available to resort guests. The Valmont treatments utilize their unique ‘butterfly motion’ technique, boosting circulation and lymphatic exchanges. Additionally, Valmont’s original treatment created in 1985, the Vitality of the Glaciers facial, will also be incorporated into Terre Blanche’s ‘Harmony Retreat’, a two day escape designed to balance the body and mind. 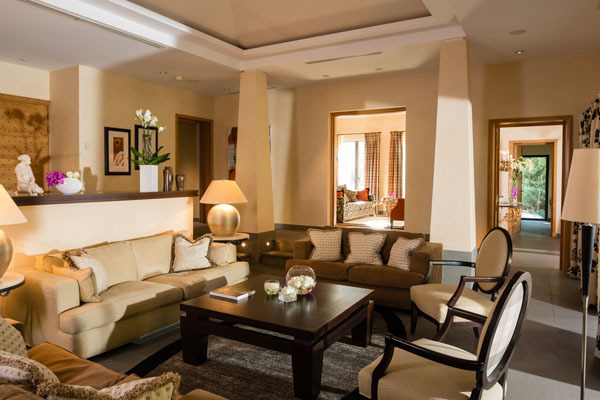 The Deluxe Suite accommodations at Terre Blanche offer comfort and space in surroundings that are both elegant and relaxed. The spacious bedroom has a King size bed, a large dressing room with an enormous separate living area with a sofa bed to accommodate an additional adult or two children under the age of 12. The spacious marble bathroom has a shower and separate bathtub. For the ultimate escape they offer their Méditerranée Villa, discretely tucked away from the hotel’s other Suites and Villas. Its bedroom boasts a King size bed, two dressing rooms and a bathroom with shower and bathtub. There is also a sofa bed in the lounge allowing you to accommodate an additional adult or two children under 18. The villas also have their own private pool and lounge chairs. 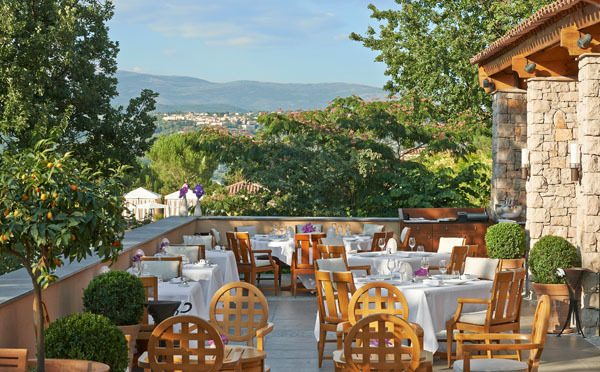 Terre Blanche’s four restaurants, including the Michelin-starred La Faventia, offer something for everyone. Most guests enjoy breakfast through dinner in Le Gaudina, an elegant and friendly restaurant with all the charms of a stylish brasserie. Their menu offers a light and sophisticated Provencal fare. Les Caroubiers looks out onto the golf club and is the place to take break in the Clubhouse. Their Le Tousco restaurant is a relaxed spot next to the infinity pool and serves as the hotel’s summer restaurant. Le Patio opens in the spring where their sunny terrace serves breakfast and in the summer evenings it transforms itself into a family friendly steak house. As for amenities, hotel guests benefit from access to the outdoor infinity pool with stunning panoramic views over the villages, as well as unlimited access to Terre Blanche Spa. Younger children will be welcomed at the Royaume des Enfants kids club where they will find their own pool and a huge selection of activities to entertain them.